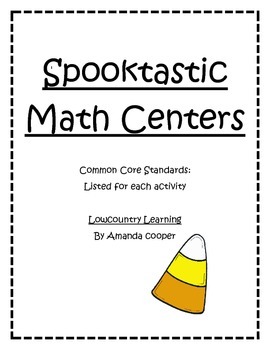 100 pages of Spooktastic center games and flash cards for ELA and Math! What a GREAT way to get students to practice their learned skills on one of their favorite holidays! 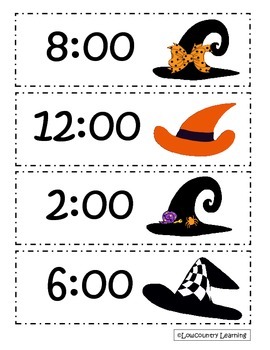 ** Halloween Time cards - Here are Halloween themed time flash cards. 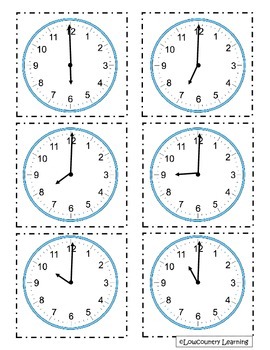 Your students will love choosing a time card, finding its matching clock and recording their results on the activity page. I have included times to the hour, half-hour and quarter hour so that you can use it for an introduction and continue to add in as you progress in your unit. It is also great for an enrichment or remediation activity in math centers! ** Halloween Double Digit Addition (no regrouping) - Here are Halloween themed double digit addition flash cards. Your students will love choosing an addition problem card, finding its matching answer, and recording it on their activity page. It is great for small groups, centers, and an enrichment activity for early finishers! I have included 32 different addition matches so that you can use it whole group as well. ** Halloween Double Digit Addition (with Regrouping) - Here are Halloween themed double digit addition with regrouping flash cards. Your students will love choosing an addition problem card, finding its matching answer, and recording it on their activity page. It even includes a box to remind them to carry their tens in regrouping! ** Halloween Double Digit Subtraction (with Borrowing) - Here are Halloween themed double digit subtraction with borrowing flash cards. Your students will love choosing a subtraction problem card, finding its matching answer, and recording it on their activity page. It is great for small groups, centers, and an enrichment activity for early finishers! I have included 32 different subtraction matches so that you can use it whole group as well. ** Halloween Place Value Cards - Here are Halloween themed time flash cards. Your students will love choosing a number card and finding its matching base-ten blocks card. I have included numbers up to 999 so that you can use it for an introduction and continue to add in as you progress in your unit. It is great for small groups, centers, and an enrichment activity for early finishers! ** Halloween Measurment Activity - In this activity, your students will use candy corn to measure different Halloween related characters and record them on their activity page. I have used it in first and second grade. Each grade level standards activity is included. 1- First, you can have the students work together or independently to match the word cards with the picture cards. 2- Or, you can have the students work together or independently to choose 10 out of the 16 cards and put them in ABC order. They then complete the attached worksheet. **I usually do both activities! I have my kids work on matching each word card and picture card in a center for the first few days, then give them the task of putting them in ABC order. This gives them confidence in knowing what the words say when the next activity is presented! However you choose to use them in your classroom, it is a great holiday themed activity!! I hope you and your students enjoy each of these Spooky activities as much as we do!! Don't forget to check out my other holiday activites as well! !